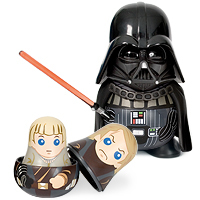 Here’s the latest Star Wars toy: a series of 6 nesting dolls, dubbed the ‘Star Wars Chubbies’. It’s already With a cartoony look, small size and apparently a high quality finish, these little toys have a pretty good potential of becoming valued collectibles. Most of the dolls depict the evolution of their respective characters, but there are also two exceptions. Just a tad larger than the RC R2-D2, they could also be good desktop companions or just something to play with when bored. Obi Wan = 3 stages of Obi Wan Kenobi. Some bad news now: the cute little PVC dolls will only be available starting May 9th. The good thing: you can already preorder them for 11,70 Euros at Firebox via Fosfor Gadgets. They look quite cool. Nice find!